Don’t worry, this is part five of five…last of the Korea trip posts, and only three weeks after our return! 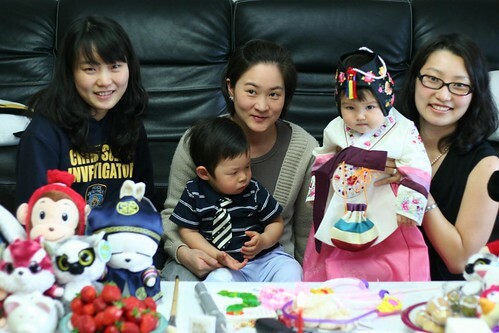 In Korean culture, a baby’s first birthday is a major event. 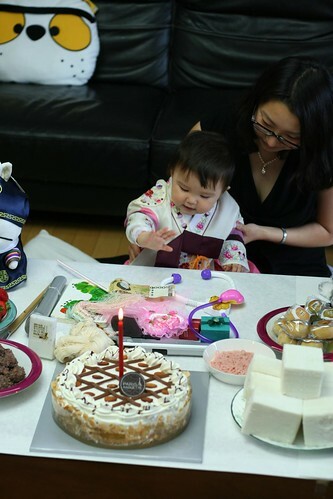 Not only do people host parties with their friends to celebrate, but they also mark the occasion with a ceremony called a ‘Dol’, where the baby dresses in traditional Korean clothes and is placed in front of a table full of food, decorations, and series of items for the baby to choose from. 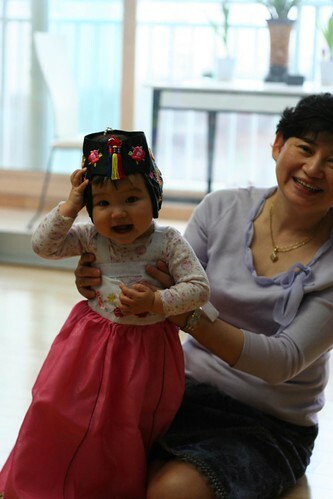 The item that the baby picks up first is supposed to indicate the profession or future of the baby later in life. 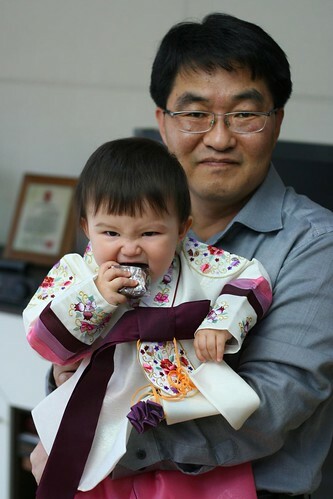 When Yenari was a baby she chose a pen and a book – foreshadowing the fact that she would spend a lot of time studying…a fortune that came true! 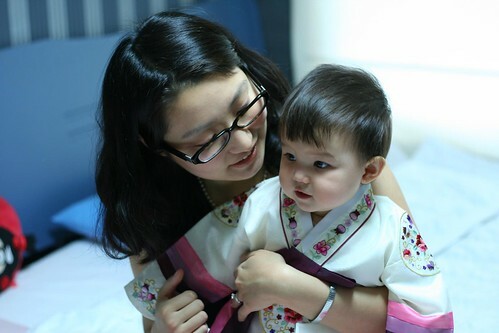 Even though our area of California has a very high population of Koreans, there aren’t really many places where you can buy Korean traditional clothes, and especially not many where you can buy traditional baby clothes. So, one of our goals on our trip was to find clothes for Hazel for her upcoming birthday (just one month away!). 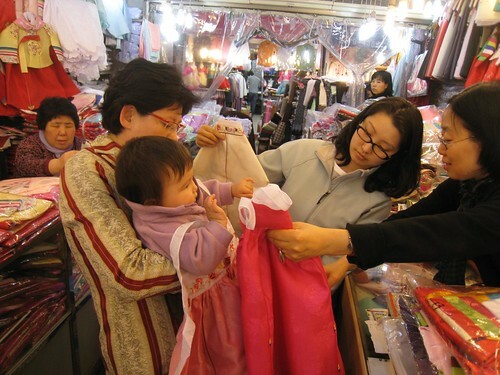 Yenari’s grandmother said that she wanted to buy the clothes for Hazel and knew just the place for it – an open market in the middle of Seoul – a wild place filled with thousands of tiny shops, food sellers, and lots of commotion. 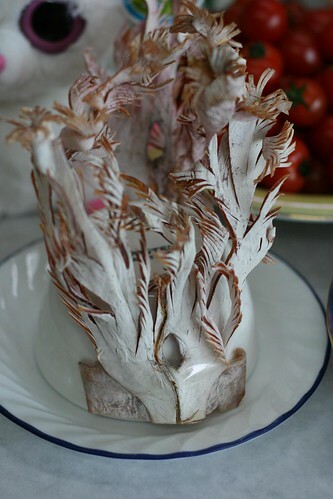 We spent a while there with Yenari, her mother, and her grandmother talking to the women behind the counter and seeing what they had to offer. 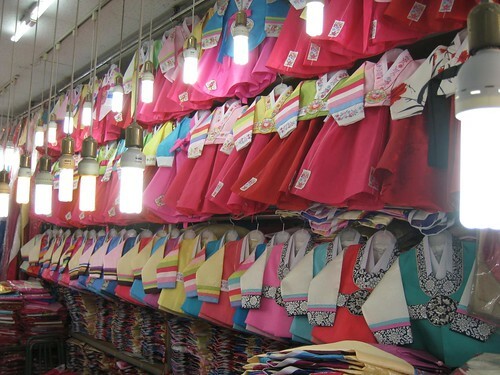 After serious debate on exactly how hot the hot pink of the dress should be, and after holding up many different hanboks to see how they’d look on Hazel we made our choice and followed Yenari’s grandmother out of the maze. 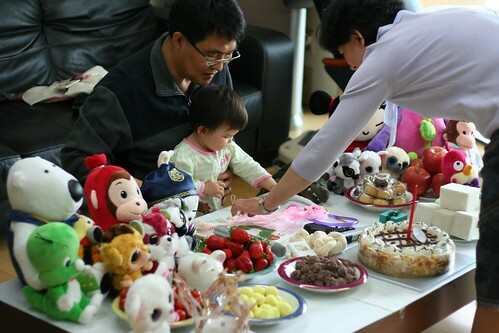 On way back home, Yenari’s grandmother and mother were both feeling a bit sad that they wouldn’t actually get to see Hazel wear her fancy new clothes at her Dol, so we suggested that we have an early birthday party for Hazel (2 months early) so that all the family in Korea and Yenari’s friends could be a part of it. Everyone was excited about the idea and we planned the party for the weekend before we were to leave. 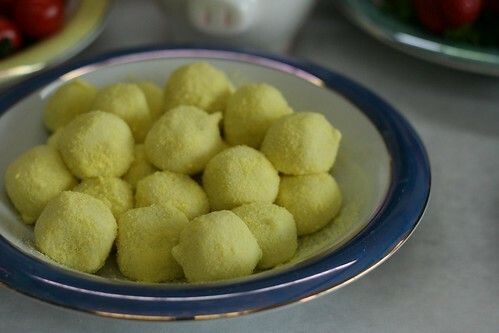 Yenari’s grandmother started all of the cooking and decorating preparations just about as soon as she got home. 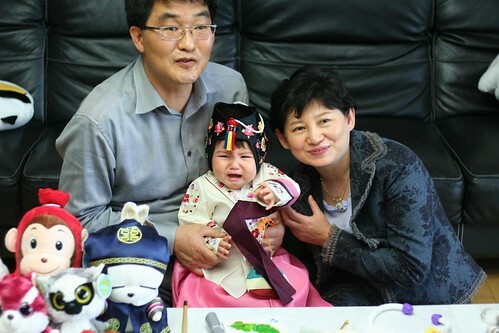 and a not so happy photo of Hazel with her grandparents! We were all so happy that we decided to have this fake birthday party and celebrate Hazel’s Dol. While this was the fake one it’ll definitely be much more authentic than the one we’ll do here in a few weeks. 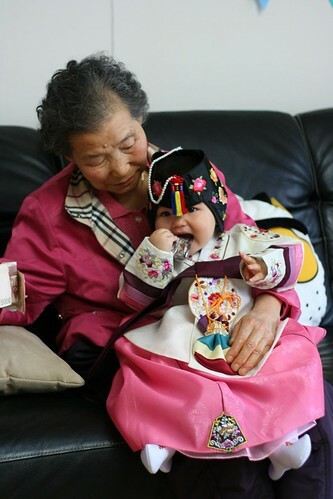 A huge thanks to Yenari’s grandmother for both buying the hanbok and for preparing all of the rice cakes and decorations, thanks to Yenari’s parents for for hosting the party and preparing the table, and thanks to everyone who make the trip out to celebrate with us and who got Hazel such nice presents. We had another three days in Korea, but I’ll spare you all and not go into extreme detail on each and every minute. We visited Yenari’s grandfather’s grave in the countryside, we met Yenari’s father’s extended family (who Yenari hadn’t seen in about 10 years), had some last visits with Yenari’s buddies DoYoung and Eulji, and spent more time with Yenari’s family. 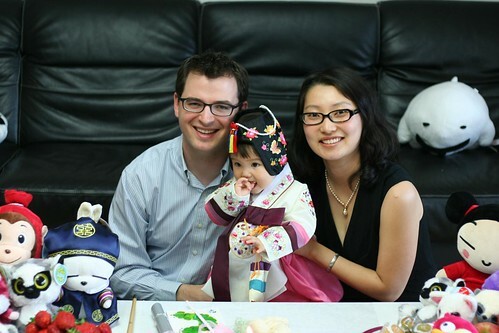 It was a great trip and it was so nice to see Hazel get to know Yenari’s family and to have her spoiled with all of the attention. She changed a lot in this trip and started to look a lot more like a kid and a lot less like a baby (looks can be deceiving sometimes though!). Very cool tradition. Great photos, too. I LOVE the last one. Glad you guys had a good trip! just wondering.. how much did the hanbok cost in Korea? 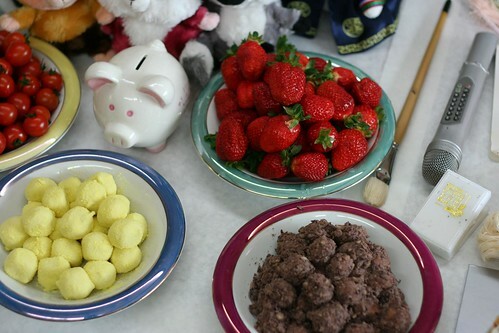 Im debating if i should ask a family member to buy one from Korea on their way in or if I should buy it in LA. Price in LA is about $140. : I Love your recap, I read them after viewing the show, beuscae I don’t want to stop the mood, the moment of joy, where I am!! It’s like viewing the show another time with a friend ah ah I also love to read all the comments here, it’s very cool :pThis show hooked me at the first episode, first for the lead actor beuscae I loved him in Birth of the rich , but the story was sooo gooood! and as a fan of sci-fi, I’m quite petty when it comes to time-travelling, but this story is quite satisfying! I still have some unresolved questions, but perhaps we will the answer before the end The entire show was so brilliantly done until now, so very well balanced, so adorably cute and thrilling in the same time!Thumps up to the actors, the directors et scenarists! Chapeau bas! , as we say in French ! Merely wanna input on few general things, The website pattern is perfect, the content is very excellent :D.